An Aboriginal family at the mouth of the Seine River in the Red River Settlement. Painted by Peter Rindisbacher in 1822. Thus the recognition of a Métis Aboriginal right to fish in parts of Saskatchewan does not mean that the same right will be automatically accepted in other provinces. In Van der Peet, the Supreme Court indicated a test for determining Aboriginal rights in Section 35 (1) of the Constitution: “identifying those traditions, customs and practices that are integral to distinctive Aboriginal cultures will serve to identify the crucial elements of the distinctive Aboriginal societies that occupied North America prior to the arrival of Europeans.”  Again Lamer C.J. stated: “... in order to be an Aboriginal right an activity must be an element of a practice, custom or tradition integral to the distinctive culture of the Aboriginal group claiming the right.”  In this sense, the activity can not be incidental or occasional. The courts are to look for evidence that “...the practice, tradition or custom was one of the things which made the culture of the society distinctive—that it was one of the things that truly made the society what it was.”  Lamer C.J. stated: “The task of this Court is to define Aboriginal rights in a manner which recognizes that Aboriginal rights are rights but which does so without losing sight of the fact that they are rights held by Aboriginal people because they are Aboriginal ... the Court must define the scope of s. 35 (1) in a way which captures both the Aboriginal and the rights in Aboriginal rights.”  The judicial recognition of Aboriginal rights do not arise by happenstance. Taché lamented the lack of diversity according to scientific classification, however, he conveyed the importance of fisheries by recording a Métis perspective. The most significant fishes in terms of supporting human populations in Manitoba include: lake sturgeon (Acispenser fulvescens), lake trout (Salvelinus namaycush), arctic char (Salvelinus alpinus), tullibee (Coregonus artedii), lake whitefish (Coregonus clupeaformis), goldeye (Hiodon alosoides), northern pike (Esox lucius), yellow perch (Perca flavescens), the sauger (Stizostedion canadense) and the pickerel (Stizostedion vitreum). The fact that these species occupied different habitats and were found in different regions of the province, and that they congregate at different times, meant that a steady supply of fish was available. Fisheries were a source of abundance for Aboriginal people. Classification of Indians as “hunters” has obscured the importance of fish, and the location of many archaeological sites at narrows and rapids is indicative of the use of fish. Archaeological evidence also suggests that fish took on increasing importance over time. Because fish could be harvested relatively easily at spawning times Manitoba’s numerous fisheries were a reliable food resource for Indians before contact with Europeans. The seasonal availability of a variety of fishes throughout much of the year ensured a reliable source of food. Fish were also reliable in the sense that when other more preferred sources of food failed, fish were available and prevented hardship. The use of fish by northern plains Indians is perhaps a good test of the importance of fish in a geographical region that has been regarded as fish poor and a cultural area whose population has been purported to be totally dependent upon the bison. Archaeologist Brian Smith has provided evidence that there has been an over-emphasis on the importance of bison in parkland and plains. He challenged the long established view that the culture of northern Plains Indians can be characterized as an absence of fishing. Clearly, for some Indian Nations that occupied the parkland/plains region, fishing played a notable role in the annual cycle of economic activities. Hauling in fish nets in northern Manitoba. These nets were woven from spruce and willow roots, with stone sinkers and carved wooden floats. Because fish could most easily be caught when they concentrated, fishing sites were important locations in the seasonal rounds of Aboriginal people. Clearly fish provided sustenance, but fishing as an activity satisfied social purposes as well. Fine-day (Kamiokisiskwew) was a key source of information for Mandelbaum’s field studies. Fine-day told Mandelbaum: “The whole camp would go to use a weir. There might be two or as many as fifty or sixty ... There were some places in the river that we came back to time after time ... No matter who made the weir, all encamped around it got an equal share of the fish.”  Fine-day’s account indicated that the camps could be large or small, that river fisheries were exploited regularly and all benefited from the harvests of the weir. Mandelbaum also recorded that “Dried fish were pounded, mixed with berries and fat, made into pemmican.”  The technique of preserving fish as pemmican indicates that this resource was not merely a diversion from bison, but that fish could be stored in order satisfy food needs long after the fishing season had passed. In the fur trade era, fish were an importance source of “Country food” for provisioning trading posts. Importing English provisions by the Hudson’s Bay Company, even to the posts of the Hudson Bay coast, was expensive. Country provisions, including fresh meat, dried meat, fowl and fish, lowered the operating costs of the trading companies. When fur trading companies expanded inland, posts were located near well-known and productive fisheries. Much of the daily routine of post life was absorbed by tending nets and hauling fish. Reliable freshwater fish often ensured the survival of Aboriginal peoples and trading personnel when other food resources were scare. By use of a fence or weir to pen sturgeon Natives ensured that sturgeon were available for much of the summer. Freshwater fish, especially the whitefish, were an essential source of sustenance for the populations of Rupertsland. Fish were a considerable resource for both Europeans and Aboriginal peoples during the fur trade. Manitoba historian W. L. Morton noted that in the more northern regions “... dried whitefish and caribou venison kept the lonely traders from starvation.”  Even the marginal fisheries of the Hudson Bay Lowland provided important Country Provisions. At York Factory in 1874 some 30,981 fish made their way into the post’s provision shed. But fish were also important to trading posts in the prairie/parkland region. In 1807-08, 41 people living at the HBC Pembina post consumed 1150 fish of various kinds and 775 sturgeon which weighed between 50 to 150 pounds. With respect to the parkland area just west of Manitoba, Bishop Taché described the Qu’Appelle River as “... a small stream running through a delightful valley, and of which the expansion forms eight lakes, where the best kind of white fish [sic] abounds.”  Certainly our appraisal of resources has changed since the fur trade era, in part because the original fish stocks have been affected by more intensive exploitation and changes to habitat. Norway House post journals between 1872 and 1876 indicate a cycle of fishing which took full advantage of the seasonal availability of different species. The fall whitefish season provided a major food inventory which was stored at the posts. In the early spring jackfish or northern pike were sought, in the early summer sturgeon were brought in, in the fall whitefish were the mainstay, and whitefish were again caught after freeze up and Indians traded sturgeon to the post in late winter. Fish were not only consumed by post personnel, but fish provided the main source of food for sled dogs. Moreover, Native peoples could come to the post for fish when other sources of food were scarce. After 1870, fishing remained an importance source of food for HBC posts such as Norway House, Fort Churchill, York Factory, Oxford House, The Pas, Moose Lake, and Berens River. In terms of the commitment of labor time, post journals reveal that more time was spent fishing (repairing nets, setting and attending nets, hauling fish) than trading furs. Today, it is scarcely imaginable that the waters of the Red and Assiniboine rivers in the vicinity of Winnipeg harbored productive fisheries. Yet from the beginning of the colony until its development as a relatively large, diverse settlement, and even after its joining with the Dominion of Canada, the river and nearby lake fisheries were an essential resource. Again an emphasis on the buffalo hunt in historical writing on the colony has overshadowed the less dramatic gillnet fishing. Clearly, even at a date long before the demise of the herds, bison and freshwater fish together provided complementary sources of food for the development of the Red River Settlement. The colony could not quickly or easily secure more stable food supplies and Morton stated: “Fortunate as the harvest was, fish from the river and the buffalo hunt at Pembina were once more the staple support of the colony during the winter of 1815-16 ...”  Even with the development of agriculture at the Settlement, fish remained a significant source of food for the livelihood of the inhabitants. The livelihood of the first European agricultural colonists was crucially dependent on local fish, but fisheries would remain an significant resource for the Red River Settlement long after 1812. The form of land use, land tenure and land survey at Red River was essentially egalitarian. The levees and flood plain were dissected by legal divisions of narrow river lots. Thus everyone had access to the river, the treed belt running along the river banks, the higher and well drained soils near the river banks and the hay lands that were lower and located further from the river. Any other division of the land would have resulted in the misallocation of the natural resources found along this topographic profile. 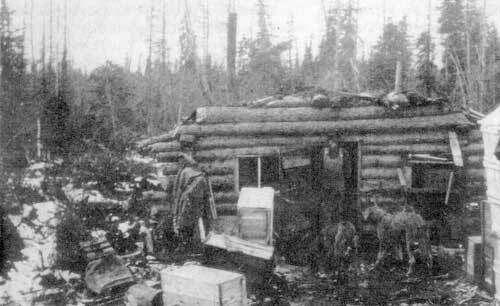 W. L. Morton noted that the Métis “... built their cabins in the wooded fringe of the river front for the sake of shelter and fuel. From the river itself they drew water and fish.”  Similarly, Morton noted that for the Métis of White Horse Plains (Parish of St. Francois-Xavier) the buffalo hunt and the fishery of Lake Manitoba were “the chief occupations.”  Historical geographer John Warkentin noted that “the settlers farmed the lots in the hope of supplying the Company with produce, but they were also engaged in hunting and fishing ...” and that the river “was as essential an element of the settlement as the very best land they tilled, and therefore it was natural that everyone should desire to live along it.”  More specifically, Barry Kaye, Wayne Moodie and Doug Sprague have observed that: “In the Parish of St. Francois-Xavier the population was largely French Métis; buffalo hunting, fishing, and the fur trade were their major foci of interest, resulting in small amounts of cultivated land.”  Thus the land system at Red River complemented an economic strategy that drew on a variety of natural resources. While Ross’s descriptions in The Red River Settlement are not always chronologically specific, certainly by the early 1850s Métis use of lake fisheries indicate some occupational specialization. 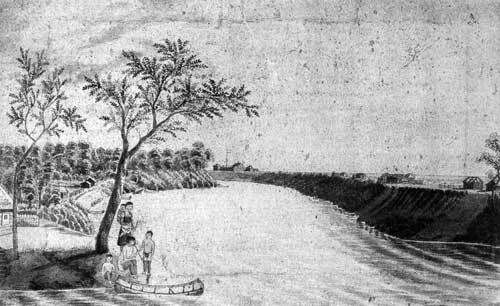 Ross’s views about the precarious subsistence of traditional pursuits may not be cogent today; but he provided documentation on the importance of fisheries to the Red River Métis. 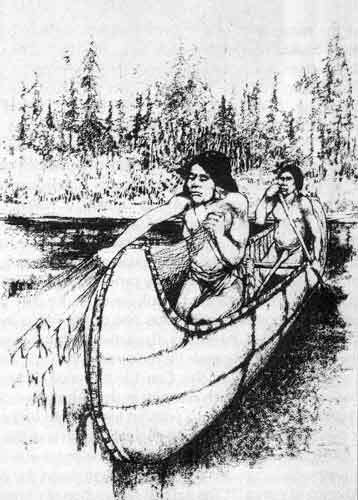 In fact, Ross identified fishing as a class of livelihood between the better off hunters and the relatively poor Métis. The fact that the nets were to be paid for out of the proceeds of the catch suggests that the means for fishing were provided on a credit basis. Although occupational specialization was evident, obtaining food from a mixture of hunting, farming and fishing was a more secure means of livelihood in the long run. In reference to Canadians and Métis, Ross stated: “They are not, properly speaking, farmers, hunters, or fishermen; but rather confound the three occupations together, and follow them in turn, as whim or circumstances may dictate. They farm to-day, hunt to-morrow, and fish the next, without anything like a system; always at a nonplus, but never disconnected.”  This account of the allocation of labor time is characteristic of a diverse and mixed economy. His account of the importance of fisheries is consistent with other observers. Fish weir on the Roseau River, 1858. Throughout the 1860s, fisheries remained important to the food needs of the Settlement. Trading fish was an activity of Red River society. For example, a HBC ledger of “colonial and country produce” for the Lower Fort Garry establishment gives account of a variety of commodities brought in for trade (1861-1862). In particular, a Mrs. Kippling frequently visited Lower Fort Garry to sell fish. In 1863-64 Sioux from the United States camped at the Red River, but even these renowned buffalo hunters came to rely on fish. Hargrave recounted that: “To the great dissatisfaction of the Saulteaux they then spread themselves in bands over the country. A large number of them went to Lake Manitoba and were extremely successful in catching jackfish under the ice.”  In 1865-66 crops at Red River had been affected by grasshoppers, but more significantly, the fall buffalo hunts “turned out a more complete failure than had been known for years,” however, “the lake fisheries succeeded as well as usual.”  Indicative of the economic importance of fish, Hargrave included price data for various Red River commodities which had been published in the settlement’s newspaper The Nor’Wester (18 November 1865). At that time, whitefish sold for 25 shillings per 100 and sturgeon 2 shillings each. With the failure of the fall hunt, the prospect of famine threatened the Red River Settlement in 1868. 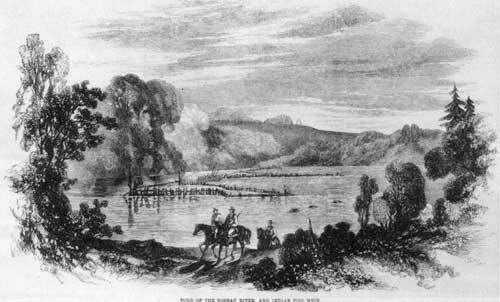 A Red River Co-operative Relief Committee was organized and one of the actions of the Council of Assiniboia was to allocate £500 for net twine, hooks, and ammunition “... to be distributed among such settlers as desired to attempt the fisheries in the neighbouring lakes.”  Joseph James Hargrave and Alexander Ross, as participants and observers of changes at Red River society, provided important evidence of the fisheries pursued by its residents. Morton also considered fishing as an improvident means of existence, but recognized that the various species of freshwater fish (whitefish, pickerel, pike, goldeyes, catfish and sturgeon) were a significant source of sustenance for many Red River residents. Both English-speaking and French-speaking Métis were involved in fishing. A fairly large-scale fishery was conducted by Red River Métis on Lake Winnipeg. Apparently this activity brought the Métis to Lake Winnipeg twice a year. While Winship did not have the same appreciation for freshwater fish as Richardson and Taché, he nonetheless recorded the absolute utility of fisheries as life-sustaining resource. The hunger of 1868 foreshadowed the great changes for the Settlement that came with the surrender of the HBC Charter of 1670, the Transfer of Rupertsland and the Northwestern Territory to the Dominion of Canada, Riel’s Provisional Government and the creation of the Province of Manitoba. But even after these events, freshwater fisheries remained important. Fish camp on Black Island, Lake Winnipeg, circa 1930. Fish were very much appreciated and recognized as an essential resource for effective human habitation of Manitoba. Lake whitefish and lake sturgeon became notable commercial catches, however, the common jackfish was a distinctive resource in the traditional economy. Fish trap on the Roseau River, 1961. This technique of preserving the fall catch of whitefish was also carried out at trading posts throughout Rupertsland. The original boundary of the postage stamp province of Manitoba failed to include the Lake Winnipeg fisheries with the settlement belt of the Red and Assiniboine rivers. Given the level of fishing activity of its inhabitants, Gunn’s concern about an oversight concerning a political boundary is understandable. All combined, whitefish, sturgeon, goldeye, catfish and northern pike provided basic sustenance on a year round basis. Thus from 1812 through to the mid-1870s freshwater fish were of particular importance to the residents of the Red River Settlement, a place known as the Métis Homeland. At least by 1850, the lake fisheries provided a specialized source of economic security for particular Métis and through the 1860s, with increasing populations and a declining buffalo hunts, the freshwater fish provided security. Even prior to the demise of the bison, various species of freshwater fish were essential to the survival of Aboriginal peoples in the parkland region of the northern plains. The development of the Canadian fur trade was facilitated by a ready supply of fish. Observers have tended to emphasize either the large buffalo hunting expeditions or else the agricultural progress of Red River society, yet a careful reading of the historical evidence shows that this predominately Métis settlement was also dependent upon fish. With the demise of bison, fishing efforts intensified and the importance of fish to the Métis was undiminished. From the original adaptation to the parkland and grassland environments, as evident in archaeological evidence, through the development of the fur trade and Red River society, fish were integral to the development of a Métis way of life. Efforts to argue for an Aboriginal right before a court without making use of the available historical evidence are likely to fail. I would like to disclose to readers that I gave testimony in the Morin and Diagneault case. A report for R. v. Braconnier and Vermeylen (Provincial Court of Manitoba) served as a draft for this article. Comments made by Clem Chartier, Jean Teillet and Lesley Tough on the draft of the report were helpful. Chris Andersen assisted with verification. 1. R. v. Marshall,  4 Canadian Native Law Reporter (Supreme Court of Canada) pp. 161-212. 2. R. v. Marshall, pp. 168, 189-190. 3. R. v. Marshall, pp. 164 and 190. 4. R. v. Marshall, p. 164. 5. R. v. Marshall, p. 163, 171-174. 6. R. v. Morin and Daigneault  3 Canadian Native Law Reporter (Saskatchewan Provincial Court) p. 173. 7. R. v. Morin,  3 Canadian Native Law Reporter (Saskatchewan Court of Queen’s Bench) pp. 182-208. 8. R. v. Morin, p. 198. 9. R. v. Van der Peet  4 Canadian Native Law Reporter (Supreme Court of Canada) p. 208. 10. R. v. Van der Peet, p. 200 [emphasis added]. In this judgment, the Supreme Court recognized that the pre-contact test of an Aboriginal right was not necessarily relevant to the Métis. R. v. Van der Peet, p. 207. 11. R. v. Van der Peet, p. 201 [emphasis added]. 12. R. v. Van der Peet, p. 204. [emphasis in original]. 13. R. v. Van der Peet, p. 204. 14. R. v. Van der Peet, p. 190. 15. For a dichotomous view of the Red River economy, see G. Herman Sprenger, “The Métis Nation: Buffalo Hunting Vs. Agriculture In The Red River Settlement (Circa 1810-1870)” Western Canadian Journal of Anthropology vol. 3, no. 1 (1972) pp. 158-178; which is republished in Antoine S. Lussier and D. Bruce Sealey, eds. The Other Natives: The Métis vol. 1 (Winnipeg: Manitoba Métis Federation Press, 1978) pp. 115-130. 17. This list did not include species of fish from the sucker family (Catostomidae) and catfish family (Ictaluridae). For information on these freshwater fishes see W. B. Scott and E. J. Crossman, Freshwater Fishes of Canada Bulletin 184 (Ottawa: Fisheries Research Board of Canada, 1973). 18. See William J. Mayer-Oakes, “Prehistoric Human Population History of the Glacial Lake Agassiz Region,” Life, Land and Water W. J. Mayer-Oakes, ed. (Winnipeg: University of Manitoba Press, 1867) p. 347. 19. Brian J. Smith, “The Historical and Archaeological Evidence for the use of Fish as an Alternate Subsistence Resource among Northern Plains Bison Hunters,” Aboriginal Resource Use in Canada: Historical and Legal Aspects Kerry Abel and Jean Friesen, eds. (Winnipeg: University of Manitoba Press, 1991) pp. 35-49. 20. This site was located between Mission and Katepwa lakes. Lebret is a place were a Métis population concentrated. The parkland vegetation zone is usually described as a transition between the species found in the grassland and those found in woodlands. In terms of species, the parkland region is also described as aspen grove. In the Swan River district in the locale of San Clara, the vegetation pattern can be classified as mixed woods, and as such is sometimes referred to as southern boreal forest. 21. Smith, “Archaeological Evidence for the use of Fish,” p. 47. 22. Smith, “Archaeological Evidence for the use of Fish,” p. 40. 23. Smith, “Archaeological Evidence for the use of Fish,” p. 47. 24. Smith, “Archaeological Evidence for the use of Fish,” p. 47. 25. Smith, “Archaeological Evidence for the use of Fish,” p. 47. 26. Arthur J. Ray, Indians in the Fur Trade (Toronto: University of Toronto Press, 1974) pp. 45-48. 27. David G. Mandelbaum, The Plains Cree: An Ethnographic, Historical and Comparative Study (Regina: Canadian Plains Research Centre, 1979) p. 71. 28. Mandelbaum, The Plains Cree, p. 71. 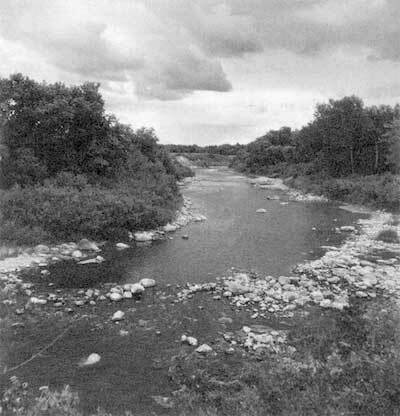 Mandelbaum noted that the Plains Cree fished rivers and not lakes. 29. Mandelbaum, The Plains Cree, p. 73. 30. Mandelbaum, The Plains Cree, p. 74. 31. Laura Peers, The Ojibwa of Western Canada, 1780 to 1870 (Winnipeg: University of Manitoba Press, 1994) pp. 22-23. 32. Peers, The Ojibwa of Western Canada, p. 70. 33. Peers, The Ojibwa of Western Canada, p. 70. 36. John Franklin, Narrative of a Journey to the Shores of the Polar Sea, In the Years 1819-20-21 and 22 (Edmonton: Hurtig 1969, Originally published in 1823) John Richardson, Notices of the Fishes, Appendix VI, p. 711. 37. Franklin, Narrative of a Journey, p. 716. 38. Franklin, Narrative of a Journey, p. 92. 39. Taché, Sketch of the North-West, pp. 212-213 [emphasis added]. 40. W. L. Morton, Manitoba: A History (Toronto: University of Toronto Press, 1967) p. 39. 41. HBCA, B.239/a /182, York Factory Journal, 1873-1881. 42. Ray, Indians in the Fur Trade, p. 131. Pembina was a post on the Red River just south of the International boundary. 43. Taché, Sketch of the North-West, p. 43. 44. For details of post economies in this era see Frank Tough, “As Their Natural Resources Fail”: Native Peoples and the Economic History of Northern Manitoba, 1870-1930 (Vancouver: University of British Columbia Press, 1996) pp. 20-34. 45. Morton, Manitoba, p. 46. 46. Chester Martin, ed. Red River Settlement: Papers In The Canadian Archives Relating To The Pioneers (Archives Branch, 1910) p. 18. Letter No. 8, Canadian Archives, Series M, 735, Selkirk Papers 3, pp. 764-794. 47. Martin, ed. Red River Settlement, p. 23. 48. Morton, Manitoba, p. 52. 49. W. L. Morton, “Introduction,” Eden Colvile’s Letters 1849-52 (London: Hudson’s Bay Company Record Society, 1956) p. xxv. 50. Morton, “Introduction,” p. xvii. 51. John Warkentin, “Manitoba Settlement Patterns,” Papers Read Before the Historical and Scientific Society of Manitoba, series 3, no. 16 (1961) p. 64. 52. For a detailed cartographic account of the seasonal activities and seasonal cycle of the Red River Métis see Barry Kaye, D. Wayne Moodie and D. N. Sprague, “The Red River Settlement,” Plate 18, Gentilcore, ed., Historical Atlas of Canada; The Land Transformed, 1800-1891, Vol. 2. (Toronto: University of Toronto Press, 1993). 53. Alexander Ross, The Red River Settlement: Its Rise, Progress, And Present State with some Account of the Native Races and Its General History, to the Present Day (London: Smith, Elder and Co., 1856, republished 1984) p. 84. The preface to Ross’s book is dated 1852. 54. Ross, The Red River Settlement, p. 237. 55. See also Sprenger, “The Métis Nation: Buffalo Hunting vs. Agriculture;” and Arthur J. Ray, “Periodic Shortages, Native Welfare, and the Hudson’s Bay Company 1670-1930,” Shepard Krech III ed., The Subarctic Fur Trade: Native Social And Economic Adaptations (Vancouver: University of British Columbia Press, 1984) pp. 1-20. 56. Ross, The Red River Settlement, p. 84. 57. Ross, The Red River Settlement, p. 85. 58. Ross, The Red River Settlement, p. 193. 59. Joseph James Hargrave, Red River (Republished by Helen Doherty, 1977, original 1871) p. 175. 60. Hargrave, Red River, p. 177. 61. HBCA, B.303/d/84, Lower Fort Garry, Account Books, 1861-1862. Kippling is identified as a Métis surname in D. N. Sprague and R. P. Frye, The Genealogy of the First Métis Nation: The Development and Dispersal of the Red River Settlement: 1820-1900 (Winnipeg: Pemmican Books, 1983) Table 1. 62. Hargrave, Red River, p. 315. See also page 318. 63. Hargrave, Red River, p. 390. 64. Hargrave, Red River, p. 506. The whitefish would be worth approximately $6.25 and the sturgeon would be worth about 500. 65. Hargrave, Red River, p. 447. 66. Morton, “Introduction,” p. xl. 67. National Archives of Canada, Church Missionary Society, Microfilm Reel A-82 (16 July 1851). 69. PAM MG2 C13, Samuel Taylor’s Journal (1849-1863) p. 50. These journals provide details of the coming and goings of fishers, the success and failures of harvesting, the types of catches and the techniques employed. Taylor even purchased fish from the HBC. 70. PAM, John Christian Schultz Papers, MG12 E3, box 19, notes of an Indian council at Treaty Rock (12 July 1890). This document has been published in Native Studies Review vol. 3, no. 1 (1987) pp. 117-127. 71. See Gerhard J. Ens, Homeland to Hinterland: The Changing Worlds of the Red River Métis in the Nineteenth Century (Toronto: University of Toronto Press, 1996) pp. 90, 110. 72. PAM, MG3 B15 George B. Winship, Extracts from G. B. Winship accounts of events at Red River, 1869-1870, (1914) p. 15. 73. CSP, 1873, Fisheries, no. 8, p. 194. 74. CSP, 1873, Fisheries, no. 8, p. 194. 75. CSP, 1873, Fisheries, no. 8, p. 194. 76. CSP, 1876, Fisheries, no. 5, p. 225; and CSP, 1873, Fisheries, no. 8, p. 194. 77. CSP, 1877, Fisheries, no. 5, pp. 350-1; and CSP, 1878, Fisheries, no. 1, p. 311. 78. This is evident from voting behavior. See Ens, Homeland to Hinterland, pp. 140-149. 79. CSP, 1875, Fisheries, no. 5, Appendix No. 21, p. 172. 80. CSP, 1875, Fisheries, no. 5, Appendix No. 21, p. 172. By our people Gunn means residents of the Red River Settlement. 81. CSP, 1875, Fisheries, no. 5, Appendix No. 21, p. 173. 82. CSP, 1875, Fisheries, no. 5, Appendix No. 21, p. 173. 83. CSP, 1875, Fisheries, no. 5, Appendix No. 21, p. 173. 84. CSP, 1875, Fisheries, no. 5, Appendix No. 21, p. 173-174 [emphasis added]. 85. CSP, 1876, Fisheries, no. 5, Appendix No. 21, p. 225. 86. CSP, 1876, Fisheries, no. 5, Appendix No. 21, p. 225. 87. CSP, 1877, Fisheries, no. 5, Appendix No. 22, p. 348. 88. Frank Tough, “Manitoba’s Commercial Fisheries - A Study in Development,” MA thesis (Montreal: McGill University, 1980). 89. Frank Tough, “The Establishment of a Commercial Fishing Industry and the Demise of Native Fisheries in Northern Manitoba,” Canadian Journal of Native Studies vol. 4, no. 2 (1984) pp. 303-319. 90. T. R. Weir, “Settlement In Southwest Manitoba, 1870-1891,” Papers read before the Historical and Scientific Society of Manitoba, series 3, no. 17, 1961-1962, (Winnipeg: 1964) p. 60, citing a Dominion Lands Survey Report. 91. CSP, 1887, Fisheries, no. 16, p. 312. 92. CSP, 1888, Fisheries, no. 6, p. 307. 93. Nonetheless, low incomes of fishing lead some to suggest alternatives, see Jean H. Lagasse, The People of Indian Ancestry In Manitoba: A Social and Economic Study 3 vols. (Winnipeg: Department of Agriculture and Immigration, 1959). 94. CSP, 1902, Fisheries, no. 22, p. xxxv [Emphasis added]. 95. CSP. 1911, Fisheries, no. 22, p. 216.